ZDogg — aka Dr. Zubin Damania, a doctor and a hip-hop humorist of healthcare — was in the house at 23andMe last week, for a conversation with our CEO and co-founder Anne Wojcicki for his Facebook Live show, Incident Report. Thick with fun and facts, the wide-ranging hour-long conversation was meant to focus on what direct-to-consumer genetic testing means for health care professionals, many of whom have been critical of offering genetic health risk reports to consumers. In the last few years, 23andMe has engaged with physicians and other health care professionals both for training but also to improve what we do. 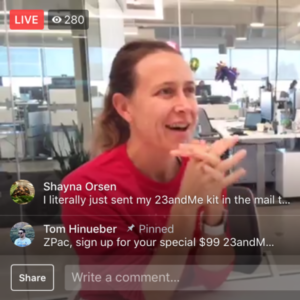 “To me, the most important thing that 23andMe is doing is we’re giving the consumer a voice in healthcare for themselves,” Anne told Zubin. But she added that to make the kinds of changes to the healthcare system that would empower consumers, it has to be in partnership with the medical community. A longtime customer of 23andMe, Zubin has carved out a unique following among his fellow physicians, not just an entertainer but as a healthcare visionary and evangelist for what’s being called the Health 3.0 Movement. This started back when he was still in residency at Stanford when he first started making parody rap videos tweaking the lyrics of Tupac or Jay Z rhymes with his own, railing against what he sees as a dysfunctional healthcare system that offers more rewards to treating illness than on preventing them from happening in the first place. Beyond poking fun at the system, Zubin also set up a widely lauded but now closed clinic in Las Vegas called Turntable Health, that attempted to flip that paradigm around, based not on a fee per service but instead on a sort of monthly membership fee in a full-service clinic set up to keep them healthy. The emphasis was on prevention and fostering a deeper doctor-patient relationship. Check out Zubin and Anne’s conversation below.